Every planet is a choice. Every choice has a consequence. 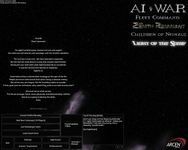 The Zenith Remnant is the first expansion to Arcen Games' hit space-based indie RTS/4X hybrid, AI War: Fleet Command. This expansion includes a massive amount of new content that brings the galaxy to life in exciting ways. Capturables, special AI ships, and ancient alien artifacts litter the cosmos, making your choices as a player more varied than ever. Do you risk total war with the AI by capturing and rebuilding a massive golem? Do you procure defensive superweapons from Zenith traders? Maybe you'd like to finally be able to build the powerful Core ships that the AI has long used -- or the all-new experimental ships with strange and powerful abilities. Befriend the dangerous alien Dyson Sphere by helping it against the AI forces, or sneak around it to avoid incurring its wrath (that thing is moody). If you see a Devourer Golem, don't forget to run -- preferably as it pummels your enemies. Any path you take, there are consequences; AI War is known for being heavily strategic even amongst strategy games, and The Zenith Remnant takes it to new heights. Want to read about all the features in extreme detail? You can of course try the demo of the expansion to make sure that you know what you're getting, but the full feature list is also now available on the AI War wiki. It's a ridiculously long list, but that just goes to show how much is packed into this expansion. * Dozens of other new capturables, including "experimental" ships. 4 Zenith alien minor factions (NPCs). Over 40 minutes of new in-game music tracks. Several new AI behaviors and many related special AI weapons.